We've talked about “Emergency Cooking – 10 Ways to Have a Hot Meal When the Power Goes Out“, and I firmly believe that everyone should have multiple ways to prepare a hot meal in case of emergency. If you're camping (at least around here), it's getting tougher to have an old-fashioned campfire. Due to concerns about the emerald ash borer, you can't transport wood around the state. Enter the Ecozoom rocket stove. The Ecozom is a compact camp stove designed to burn wood, biomass or charcoal that can cook a full meal with a very small amount of fuel. I was contacted by Tom from EcoZoom and he asked me if I'd be willing to host a review and giveaway. The giveaway has wrapped up, the review follows. What is an Ecozoom Rocket Stove? The EcoZoom Versa rocket stove features an abrasion resistant and durable ceramic combustion chamber with a 10 cm in diameter vertical section that forces the gases to mix with the flame, decreasing harmful emissions. The Versa adds a refractory metal liner to the inside of the combustion chamber. This liner protects the ceramic insulation, increases the life of your stove, and improves combustion efficiency. This stove features new hinged combustion chamber doors enabling for an effortless conversion from wood to charcoal fuels. Both the main combustion chamber door and the damper door (bottom door) have reinforced metal frames. They also have hinges that securely close the doors and regulate airflow. The Zoom Versa also has a durable, reformulated 3-pronged cast iron stove top that improves heat transfer for all pots including round bottom pots and woks. The stove could be used for water bath canning, provided it is well fueled. I shot Tom some questions about EcoZoom, and here's what he had to say. 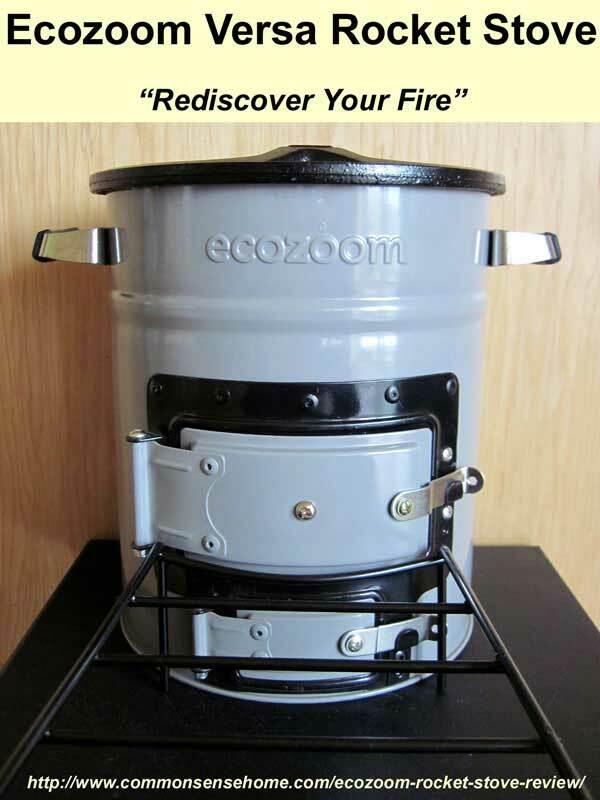 Are there specific aspects of the Ecozoom Rocket Stove that set it apart from competitors? We offer a few models that use a lighter weight insulation to save on weight as well as a double burner model. (Editor's note – the double burner model is a beast!) The biggest difference is the work we do in international countries. We have a team that is located full-time in Nairobi, Kenya working to sell our improved cookstoves to those in need as well as partner with aid organizations. To date we have delivered stove to a variety of countries and cultures where people are affected by breathing in toxic smoke while cooking over an open fire or inefficient cookstove. The reduction in fuel usage means people spend less money of fuel, have to spend less time gathering fuel, and don't have to breathe in the large amount of smoke with basic cookstoves or fires. You can read more about their international work on their website at “Public/Private Partnerships in Kisii, Kenya” and EcoZoom Partnering with MercyCorps to Help Survivors of Super Typhoon Haiyan. 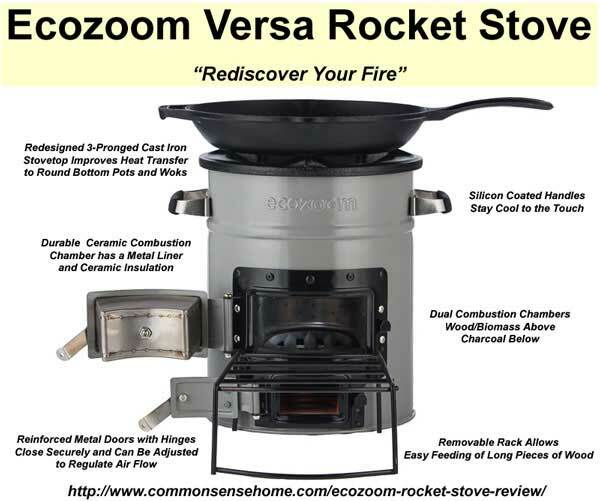 Where are EcoZoom rocket stoves manufactured? Our stoves are made in China. The long term goal is to assemble and manufacture in Africa. How long has EcoZoom been in business? Our company has been in business almost three years, growing organically each year without outside investors. Does Ecozoom offer a guarantee? We offer all of our customers a satisfaction guarantee when they receive our stove. We'll work with customers to ensure they are happy with their purchase. How much does an Ecozoom Versa rocket stove cost? The EcoZoom Versa in $109.95. Where will you ship to and at (roughly) what cost? We ship for free to the lower-48 states in the US and can ship internationally for added costs. What size and how heavy is the stove? Do you have examples on you site of where your stoves have been used in emergency situations? We have testimonials of our stoves being used in actual emergencies (thank goodness) but we have had different key influencers in the preparedness industry review our stoves. Visit the reviews pages. Is the EcoZoom rocket stove for outside use only? Correct, with the exception of the Plancha model. This could be used in a well ventilated indoor dwelling such as a cabin or yurt. Is there a warranty on Ecozoom rocket stoves? We don't have a warranty claim at the moment but as mentioned earlier we will work with customers to make sure they are happy. With proper care, our stoves will last more than 10,000 hours of cooking and have stoves used daily for hours on end in developing countries. They may not look pretty after all that time being cooked on but they will still work! Is the stove certified or recommended in any way by a third party organization (such as EU, Federal Government, military, consumer’s union, etc.)? To date we don't have any third party certification but they have been tested for emissions standards at the Aprovecho Research Center and have been piloted with aid organizations for efficacy and adoption in East Africa. We are currently working on finalizing an agreement for a large distribution project with DelAgua. This video sums up the problems that we seek to address in developing countries with cleaner burning cookstoves. The EcoZoom Versa rocket stove is a sturdy multi-fuel stove that's small enough to keep on hand for emergencies or tote along camping, but durable enough to serve as a primary cook stove in rough conditions. This article is interesting and informative to me. Really the only other way I’ve cooked food is over a campfire (other than a regular stove); but I’m interested in learning and using different cooking methods. We have a sun stove and it works great, however, there are times when the sun doesn’t cooperate! It would be great to have a little stove like this for those times! We cook in and on our Schrader woodstove from time to time. This sounds really interesting. I had recently come across directions on how to make a rocket stove out of a number ten can and have been wanting to try it, but I don’t think that would last very long. At home I use a countertop convection/toaster oven for a lot of my cooking, as I’ve found it to be very efficient and a good size for our needs. While camping I like to use a fire, although we also have a propane stove we’ll use, especially if it’s raining and we can get under partial cover. We just built an outdoor pizza oven, we’ve used it for many different foods so far. We have a propane stove my husband built for me to can on outside so I don’t heat the house up when the AC is on. I only have one burner and this would be handy for heating water and other uses in the canning process. I use a toaster over, grill, and crockpot. This would be a great addition to my outdoors adventures! This looks like it would be very, very useful!!! I use our gas range for doing most of the cooking and all of our baking gets done in a toaster oven. This would be wonderful to have for emergencies. Looks like a great product. Interesting. My husband would be fascinated with this cook stove. Grilling outside in the summer! Wow this looks great for backpacking and for emergencies. Right now we are cash flowing building our house. Mostly with recycled materials, so we are using our out door smoker and grill, oh and for boiled things like pasta the COFFEE POT. Funny this should pop up just now. I’m moving to a piece of raw land and have been practicing making a rocket stove out of concrete blocks and fire bricks. I would soooo love to have something like this instead! My crockpot and toaster get the extra jobs that my range doesn’t take. I’d love this stove for camping! This would be perfect for cooking since we live in a semi-truck. Thanks for the information about it. Great stove for camping or when the power goes out. What a cool little cook stove. I am courious to see if canning an be done on this stove. If so it would be a great addition to our home. You *might* be able to water bath can with a smaller pot, but I don’t think you could maintain high enough heat long enough for pressure canning. I’ll ask Tom. We have a charcoal grill, Volcano stove and a Wonder Oven. I was wondering…Tom mentioned that the stove will last more than 10,000 hours of cooking time, with proper care. What parts, if any, would need to be replaced for it to last that long? And are there plans to have the stoves manufactured in the U.S. anytime in the future? Thanks in advance, and thanks for the giveaway! We have a standard gas stove that can be lit with a match, a gas grill, a charcoal grill, and a small wood stove that can be set up on our back patio in case of a long drawn out emergency. We have thought about some type of rocket stove, though. This one looks like a good option. This would make a perfect gift for Eddie. Thanks for the opportunity to maybe win one! I love the versatility of this stove! We probably use our gas grill just as much if not more than our stove. Would love a EcoZoom! Thanks for the chance to win one! I sometimes use a slowcooker rathe rthan turn on the oven/stove, but otherwise I don’t really have an alternative way to cook. When I was younger, we cooked over camp fires a good bit. This would be great to win way better than cooking on a Coleman stove. Oh my goodness! I would LOVE to have one of these! Thanks for the chance to win one! This is amazing. Preparedness is ony mind a lot these days. This stove is a must-have! This is sooo what I need when the power goes out or just want to get away from the kitchen. Wow, this was really interesting! I am just starting to learn about prepping for disaster, so it is good to know about all the things out there! Thanks for offering it, Laurie! This stove has many great features. The first one being the weight. It is portable for a single person to move around. The second is that it can be converted from wood to charcoal. The third is obviously the price and the free shipping! This is definitely going to my list of things to purchase. With all the storms and electrical outages all across the states, this would be an awesome back up system for me since I live in the country where sometimes it takes longer to get service back. I would seriously like to win this! Entering for my daughter, I am not physically able to go camping out anymore. They cook over an open fire. I enjoy grilling and using a crock pot is quite common in our home. I use my bbque grill most year round. However I think that this little gem would be something I would use alot. Wow! This looks awesome. I have a propane stove and a charcoal stove. Would love to have this to compliment my backup cooking sources. I love the looks of this stove. With this or any rocket “style” stove (especially if made in China) I’d suggest giving it a dry run or two without cooking any foods. Fire it up normally and let it burn-off any impurities that are in or on the ceramic, cast iron, etc. I like cooking over a fire or charcoal, or over some apple wood to smoke the meat with flavor! I had no idea these were also being used internationally, that is very cool. Love the concept and design of the stove. I use the gas side burner on the grill to cook/can food in summer. I like this review. It gives me something to think about. Thanks for this chance to win a great prize! I use a single burner propane unit. This looks really interesting. I am looking to buy some sort of a camping/emergency stove right now. Our alterative sources are a gas grill or open fire and I need practice on the open fire not to burn everything! I love to GRILL!! This looks like a wonderful cooking option! Love IT! At this point, just a grill. But would like to try a brick oven. I cook over campfires and on gas and charcoal grills. I also have a smoker. mmm… smoke. I frequently use a grill, smoker, and crockpot. Occasionally I’ll use a homemade solar cooker. During the summer months we use the grill a lot. It saves the kitchen from all the heat produced by the stove and oven. My grill even has a burner on one side so I can cook on that if I need to. I love it! Grill, campfire, Vitamix. But always wanted a rocket stove! Thanks for the giveaway! Have wanted one of these for years! We use the BBQ almost exclusively during our 100degree+ summers as well as our propane camp stove. This year we plan on building a pizza oven for even more options. Thanks for having this giveaway! Wife and I are beginning to build up some supplies – boy would this be a nice addition. I am pretty boring…other than the crock pot and standard oven/stove. We do use the bbq grill and dutch ovens on accasion. I tend to cook on a grill or a fire pit with a dutch oven. Thanks for the chance to win an awesome looking little stove! Thank you for donating this and also for the review! The perfect addition to my off-grid supplies! I like the alternate fuel options. I live in a wooded area so I am looking for ways to use biomass instead of charcoal. OH! Please count me in! I would really use such a handy stove, if I should win it. We have a near endless supply of small twigs to fuel it too! Currently, I use a natural gas grill when I cook outdoors. But I would have no problem finding a place for this stove in my backyard too. It gets over 100 degrees here in the summer; so I love to cook outdoors then. Hoping…..
We take our ecozoom morel hunting with us… pine cones are everywhere… we collect about 20 and fry up morel poppers in the woods… my ecozoom and cast iron skillet stays in my vehicle as I have other options at home (where my vehicle also is), I dont however have other options where my car might go. We own an earlier model ecozoom with no doors, we love it to death but I dream over the versa and plan to get one asap. If I win the Versa I will pay it forward and gift my current model to my poor shlub of a fishing partner. Good luck all! I use a gas grill at home for bbq. When hiking I use he either an alcohol stove or currently a stove that I cook with esbit tabs. We used a kerosene heater when our power went out in an ice storm this past Winter! I use a camp fire a micro wave, oven/broiler, wood stoves, camp stoves, rotisseries, etc..
We also use a gas grill and a sun oven. I use a gas grill, BioLite stove, and camp fire. I would really like one of these! I have only use a gas grill and camp fire. This would be so neat to have! We like to grill, and cook on a fire outdoors. We have a gas stove and can use it when the power is out, but the Eco-zoom would be perfect to use when the gas runs out and when we go camping. We grill on charcoal and propane. Also Dutch oven cooking is great!! I would totally use this! How awesome! Heard about this on another blog..recommended! We are rehabbing the barn for a teaching and workshop space. Would love to have a quick and transportable stove to teach with. Usually cook on BBQ Grill when outside. It has been years since I cooked over an open campfire. Besides a standard stove I use a bbq grill, MSR backpacking stove, campfire, Coleman camping stove, microwave and toaster oven. this would be such a help,with our summer of camping..
Wow. This would be so handy to have. I would use it to heat up water for scaling chickens before plucking and to reduce maple sap in woods before final boil down. A must have equipment for 101 reasons. Great stove. I need one for the multipurpose value that it has. I’ve been dying to get one of these and try it out. I live in snow country and this would be such a blessing when power goes out. We’d use it for camping, and emergency situations such as power outage, etc. We use a grill, and sometimes an open fire when we are camping. I love new ways to cook. I currently do not have any other options for cooking at the moment, but I plan on buying a charcoal grill next week. I have read of your products and outreach programs before and I commend you for creating something a little old fashioned but perfectly suitable for so many situations. You cannot win if you don’t enter, so I will. Thanks. Besides the stove, we cook on the grill or on a campfire. I have never tried a rocket stove, but have been wanting too! This is the nicest looking rocket stove I’ve ever seen! And I love that you started the company organically without outside help, like companies used to do! 🙂 I can see this being a very handy item to own!! I”m going to share about this on my blog. I love rocket stoves! Great to have for camping or for emergencies. I cooked on a potbelly stove years ago and more recently over a campfire. This stove seems marvelous and I would love to win one! We have been exploring different outdoor cooking options – everything from open pits to cob ovens. I like it that this is bigger than our backpacking stoves, but still portable, and that is can burn different kinds of fuels that don’t require a gas can. I would love to win one – both for home use and car camping, where outdoor fires are often prohibited. Thanks for the info! Looks like a great company to support! Sounds like this would be a good stove to have whether you did any camping or not. I would love to own one. Have not seen them in stores. This would be awesome to win as we only have a charchole bar-ba-que and it is small. Not really big enough to cook for 5. We lose our power a lot in the winter so it is mostly cold food. This stove would be fabulous for us! Thank you for the opportunity to win one and I will definitely be putting this stove on my wish list if we don’t win! Would love to win, thanks for all the great info you post! You really have the best giveaways!! We have sed a campfire, propane stove and a homemade rocket stove to cook outdoors. Looks like a very nice stove. I do not have an emergency stove and would love to win this one! This stove looks amazing! We have been exploring ways to cook our food when the power goes out, which happens often in the summer, even when there isn’t a hurricane. I love to camp and have been in survival mode lately. I do need it! Excellent product – I’d be happy to win this one! We have used campfires, gas grill, bigger two-burner gas stove, charcoal, sun oven, and for small, simple stuff, backpacking stoves. This looks awesome! I’ve used camping stoves of various sorts and have used wood-burning options a very limited amount. This is a wonderful giveaway!!! So safe,and it looks really nice too!!!! I love that you don’t have to use gas can. I am afraid of gas grill we have one. Thank you for the offer. I use my microwave a lot, and my regular stove, or I eat out when I can. This rocket stove would be great to use when the power is out or just to cook outside in the fresh air and sunshine. Would love to win it! I use several different ways to cook but my favorite is my 1927 gas stove. It’s little and cute and works very well. For alternative cooking methods I have a Coleman camp stove, a woodstove and wood fired grill. I am looking to build an outdoor earth oven later this year. most recently, I’ve cooked in our fireplace. I made a small stove out of a cat food can that uses fuel and works great! I have two zip stoves. My mushing friend and I once did an overnight where I had one zip stove. We heated water and food for 9 dogs plus ourselves. I was inspired to purchase another one. I would love an Ecozoom Rocket Stove for my outdoor living. This looks like one great little stove. I have cooked on a grill occasionally but would prefer a stove like this that would allow me to cook in a pot, and use found fuels. We use the grill and the fire pit when we have no power! Would love one of these rocket stoves!! We have a wood stove in the house that we use in the wintertime, and then in the summer, we can cook on our gas grill, the camp stove or, if there is no propane, we can build a campfire. We have an outdoor campfire pit and a metal grill. A handy stove would be nice, though. I use a Broil charcoal starter unit w/ broken sticks and twigs quickly heats up canned items I keep one in the car. I cook on my wood stove. EcoZoom Versa Rocket is exactly what I need. I like that it is versatile with heat sources. I think it is reasonably priced. Hopefully I will win it! I camp out and fish quite often. This looks like something I could use instead of an open fire pit. Here we often have no fire days in the wilderness areas. We occasionally make a soup over the fire put my father built for us! At this point the only back up we have is an outdoor gas grill. I’m hoping to make a solar cooker some time this summer if time permits, otherwise all we have is a regular electric stove. Thanx for the review and giveaway! Was directed to this website by another blog and find this VERY interesting. Would love to try it out. Thanks for the giveaway. Just started using a homemade solar oven for drying veg and fruit from the garden. Will see how it goes. This rocket stove looks cool and would be a great addition to the emergency kit as well as for camping at the lake for cooking fish. If I win, this could be delivered to my friend in USA and I will arrange to get it to NZ. We use our outdoor charcoal grill and crock pot as an alternative cooking method. I use my crock pots a lot, but I would like to learn more outdoor cooking. I have tried over a campfire and a bbq a long time ago, but don’t remember anyone liking the idea. This stove looks like a good transition from indoor cooking to outdoor cooking. I’m thinking about making a brick rocket stove, but haven’t done more than look at the plans. What a great stove! I’ve used a lot of methods in the past – crockpot, microwave, hotpot, charcoal BBQ, gas BBQ, campfire… but right now I mostly use my oven and stove top. My goal is to go off the grid, and this is certainly a great stove for that! We cook over a camp fire, with an outdoor pizza oven,grills and a smoker. I love the idea of having it for field days, picnics, and even camping. The fact that it is durable and easy to handle, uses less fuel and also biomass make it a must for emergency cases, or just for fun. I have been building a survival emergency supplies storage, this stove would be a great addition to it. This would be a welcome addition to an outside kitchen and very handy for all those weather outages. Thanks for giving us a chance to win one. A small outdoor kettle grill is our only other options at the moment. Eventually, I’d like to put in a built in outdoor kitchen into the back yard, as well as acquire some mobile camping equipment. I’ve very recently been collecting/preping this would be an awesome addition to my stash! I have cooked over open fire, wood stove, gas grill, charcoal girl, and conventional gas and electric appliances. I also have a two burner Coleman stove for camping/emergency and have been researching Rocket stoves for cooking and home heating. Hoping to build and live off-grid in next year and the EcoZoom Versa would make a great addition. Also exploring solar cooking, makes me want to go grab my car’s sun screen now and give it a try! Love the idea of using this stove in 3rd world countries!! This certainly would be a great addition to anyone’s prepping stash!!! We have a little tripod butane camp stove that cooked all our meals for a week when we lost power due to a tornado. This stove would have been so much better. Right now our only other option is cooking over an open fire. I’ve looked at sun stoves and other rocket stove plans, just haven’t gotten around to trying to build one yet. This Ecozoom appears to be another affordable option. Cooking stoves are one area where I’m woefully lacking in my preparedness plans. This would be a perfect addition! Campfires, when able are mighty handy. Great looking stove. I’ve been wanting one for camping and would love to win. Thanks. We use the traditional stove, an outdoor wood grill/smoker, and a fire pit that we cook our maple syrup in. This would be a great addition, for canning, camping and other outdoor cooking needs. We have a BBQ and a Dutch oven for cooking when the oven is out of order. Would love this alternative to using my Sun Oven when the weather doesn’t cooperate! I cook with an estate wood stove! I love this though! I’ve never seen one like this! I love grilling, but also use dutch ovens, hobo packets, skewers, and occasionally my little gas oven. i eat raw a lot. I have only cooked with an electric stove and our propane campstove… I know I need to expand my cooking options! Used a propane stove, this one looks better! We don’t use a traditional stove much – mostly grill and dutch oven cooking. Love to have one of these. Besides a crock pot, I cook on a propane grill and/or charcoal grill. Would love to have one of these! I have cooked on open campfire. Always wished for one of these I think they are awesome. I would love to try one of those stoves out. It is nice and compact.